Pandora streaming music in your menu bar. Is there a better alternative to Fury? Is Fury really the best app in Audio category? Will Fury work good on macOS 10.13.4? Fury is Pandora in your menu bar. Growl notifications. Awesome! Fury is a simple utility that runs Pandora in its own mini-browser. Most importantly, though, it lets you load stations, skip and rate songs, and see what's currently playing, all from the menu bar. It also provides Growl notifications when songs change or you rate one up or down. Log into Pandora using Fury's mini-browser. Close mini-browser and operate Pandora from the menu bar. Added thumbs up/down indicators to Growl notification images. Fixed "Disable Notifications" preference bug. Notifications can now be disabled. Fury needs a rating. Be the first to rate this app and get the discussion started! Fury will automatically log you in and remember your last station and song the next time you launch it. Your station list and sorting preferences are captured when you first launch Fury and updated when songs change. 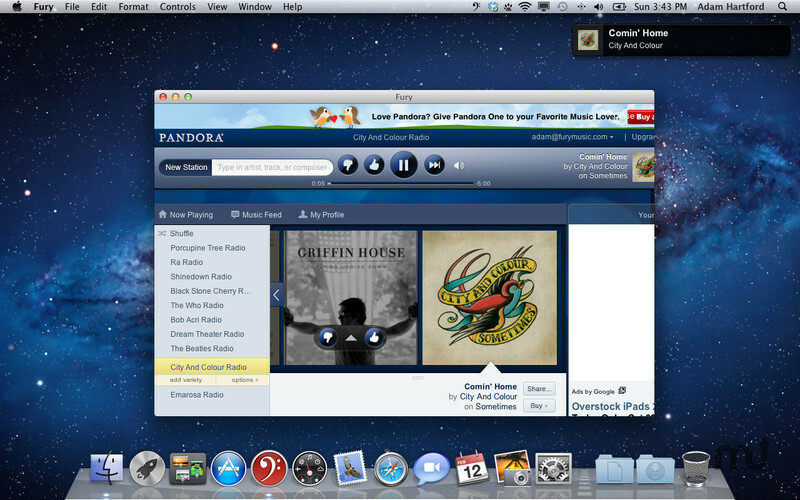 Pandora is much more pleasant to use on the Mac when you're not tied to a Web browser.